And then there were none: The long-awaited removal of the oil tanks at the Galway Docks brings the Volvo Ocean Race stopover a step closer and the future redevelopment of the area. The Volvo Ocean Race, the largest offshore event in the world, arrives in Galway next month. It was only from the ignition of the first metal cutter at the docks on Tuesday that local people could fully engage with the fact that the Volvo Ocean Race is to land on these shores in a little over a month. Only when the first metal was cut to dismantle the massive oil storage tanks, could we fully imagine the enormity of the event that is to visit these shores at the end of next month. 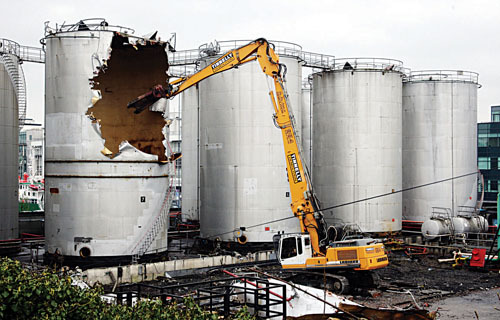 When work began on Tuesday on the dismantling of the Topaz tanks in the docks, the oft-quoted prophecy of the race organisers last year that the tanks would be gone was fully realised. At last locals can see that the race will have a legacy lasting beyond the duration of this most spectacular event. When it all packs up and goes in the middle of June, the landscape it leaves behind will be vastly different from that there at this moment. The tanks will now be consigned to the annals of history — at last, surely case of tanks for the memories. And as they come tumbling down and are carted away to become whatever old tanks become, the hands-on organisation of the Volvo Ocean Race becomes real. Already an army of people are working away like beavers in the nerve centre in the city and a larger army of volunteers are currently being organised into battalions ready to do what Galway does best — welcome and party. However removed the vast majority of us may be at this moment from the sport of sailing, this event is one that every city in the country would die for, especially in these straitened times. So let’s get involved and find out what it’s all about and how can we set about changing the use that we in Galway make of our position on the coastline. Galway has a great opportunity to, let’s be honest here, cash in on the marvellous exposure that it will bring with it. I know there was a plan to keep prices at a minimum for the race, but one has to forgive people availing of the opportunity and this week, I heard that some B&Bs in the city are charging €100 a night. So, let’s not go overboard. When it was first announced, one wondered what sort of stopover this would be; how could we compete with the other romantic names on the stopover list, the likes of Cape Town, Rio, Boston, but we now realise that this stopover is destined to be the best of them all because of its uniqueness. While some of the others may have been generic enough, the Galway stopover will represent all that is best about Ireland. For the four weeks that it is here, the visitors to the event will experience a true Irish experience, with fine music from all genres but of a strong Irish tradition, fine foods and fine drinks. Indeed, the public engagement with the race will be maximised with the staging of events such as the world record jig attempt on the prom, the record attempt for Chinese Whispers to highlight the link with the Green Dragon’s financiers, and the free concerts and air display to get us all into a sense of wonderment. Over the next few weeks, we will be explaining to you all what goes on in this race, what it involves and how we can get behind the Irish challenge of the Green Dragon. The boats are on their way from Rio to Boston and from there they will cross the Atlantic to Ireland and to Galway. Let’s give them the welcome of a lifetime so that we can avail of this marvellous opportunity to put Galway on the map. We can all play a part in making this a wonderful success.